Choirs from St. Scholastica will ring in the season with favorite Christmas songs during two concerts, Dec. 9 and 10, at St. Michael's Catholic Church in Duluth. 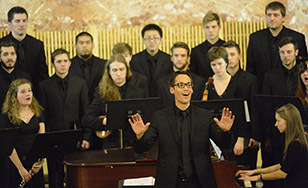 The St. Scholastica Concert Choir, Bella Voce, Women's Choir and - new this year - the CSS Men's Chorus will unite for this annual celebration of the Christmas season through song. Concerts will be at 7:30 p.m. on Friday, Dec. 9 and Saturday, Dec. 10 at St. Michael's at 4901 E. Superior St. The program will include pieces from the Renaissance to today, according to Bret Amundson, director of choral activities. Included will be works by Palestrina, Hassler, Lauridsen, and Engelhardt. The concert typically sells out, so buying tickets early is advised. Tickets are $5 and are available through the Spotlight Box Office at (218) 723-7000, spotlight.css.edu or spotlight@css.edu.